Strategies and their formulations possibly are the quickest of endeavours a human brain can devise. Strategies can happen against nature, against a being or in all, any non-constant program. Strategies are generally adopted only when there is an antithetic constraint acting against our make up. This gives a certain need to win against the oddities, sometimes, at any cost. The Theory of Games was developed by Neumann and Morgenstern as a field of study in Applied Mathematics during the WW II period to set out the outcomes for the possible choices a strategy can make. We have all been in such situations, while playing a game of chess, poker etc that we want to decide and strategise smarter and outwit the opponent . Generally while at loggerheads we have a set of strategies that we organise and throw at the opponent’s face. Also the opponent who is no less intelligent too has a set of strategies made up to flay. What is exciting is to know if they had optimised their advantages and strategies against one another. Welcome to the Theory of Games. This theory has been applied not only in Economics, but in Biology, Psychology and Logic and some other fields as well. From the Biological standpoint, it helps in understanding human behavioral trends, interactions between organisms during a struggle for survival and also helps explain the strategies used in the living system which ensures that only the “fit” survive and helps in the evolutionary processes. Imagine two players pitting themselves hostile in a game of Cross And Pile. 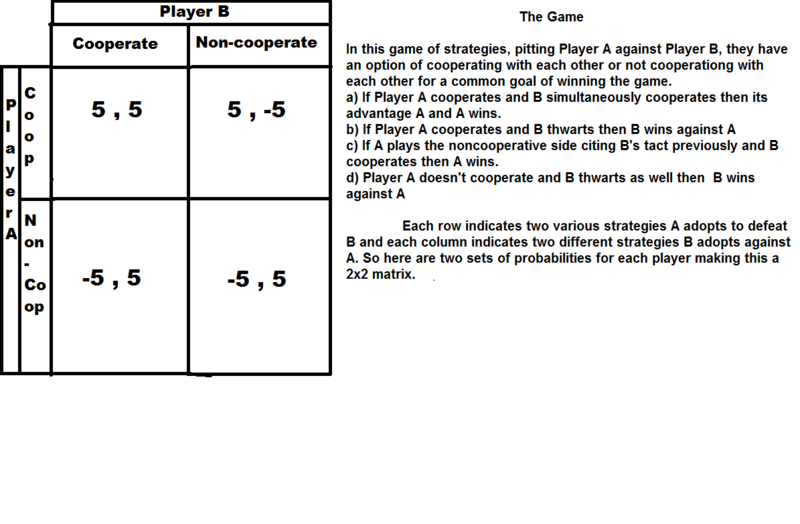 The values here are the weightiness given to each strategy of co-operation or non-cooperation adopted by the players. 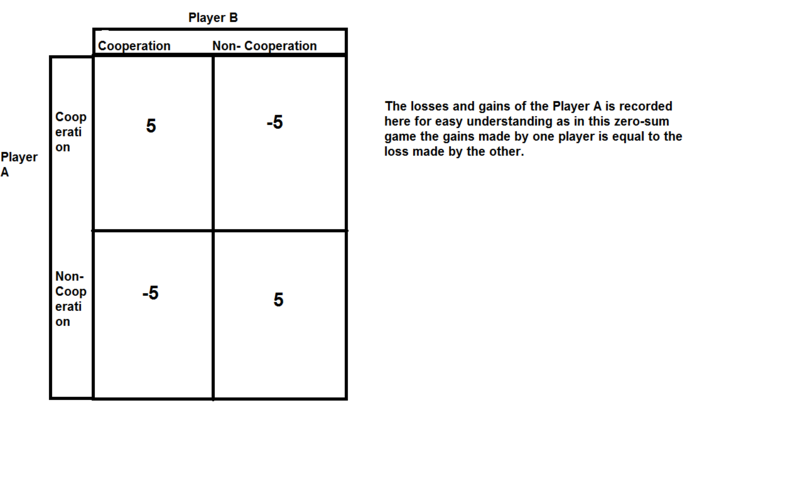 Ex;- if A shows cross (co-operates) and B shows cross (cooperates) then A wins. if A shows cross (cooperates) and B shows the pile (thwarts) then had outwitted A. Similarly lets take another matrix — this time with varied outcomes that A has two sets of strategies P1 and P2 while B has his own strategies Q1 and Q2. P and Q are just the denotation of the “probability” of strategies they might use. 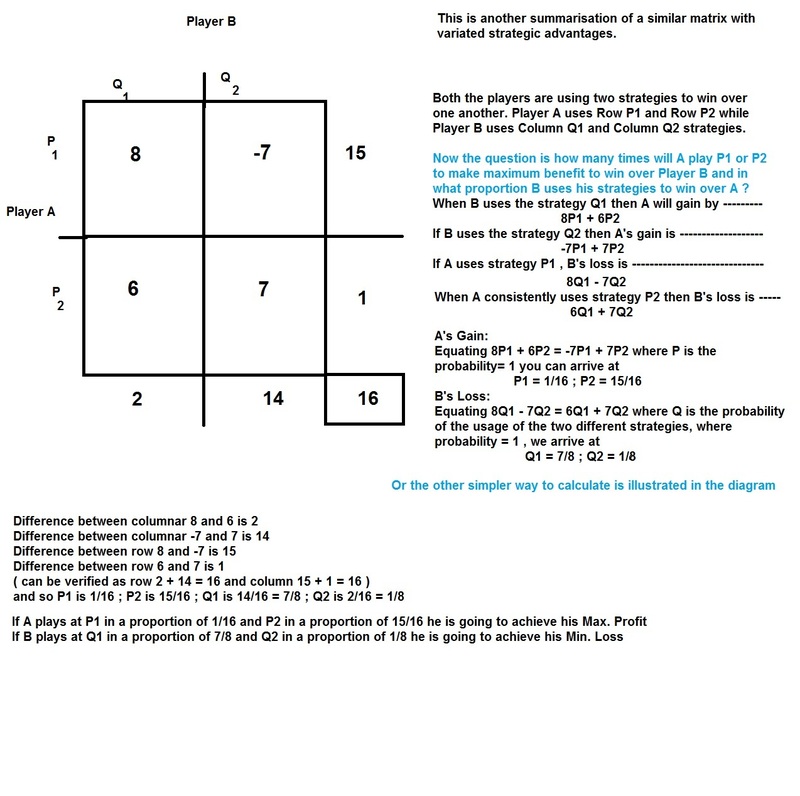 Game Theory is the probable behaviour of humans set in computational format. A was able to predict the point where B can be placed at a relative disadvantage by deriving his minimum loss to beat him in the game. There seems to be three images missing in the text. Interesting post but I think you need the images for the examples. The post is creating some problems. The images are not loading properly but they are there. Three clear images depicting all the three matrices..
Had this problem myself a couple of times. I accidentally deleted some images in the media library but in editor mode the post still looked fine. When switching to view mode they didn’t show up however. I think the browser keeps a longer cache for editor mode and that is a programming error from WordPress side. The solution was to delete the images in the post, import them from disk again and insert them into the post. Maybe this is not the problem with your post but I though I should mention it just in case. That probably seems to be the trouble, I guess. And thank you for mentioning it. I’l look into it immediately. My spouse and I smelbtud over here different web page and thought I may as well check things out. I like what I see so i am just following you. Look forward to checking out your page often.